Home » News » The Safest Way to Boost ‘Em? Newest IIHS Ratings for Booster Seat Safety! The Safest Way to Boost ‘Em? Newest IIHS Ratings for Booster Seat Safety! Before we get to the ratings, consider that most safety advocates suggest that kids be at least 4 years old before moving from a 5-point harness to a booster. Even at age 4 or 5, some kids will not be mature enough to remain seated properly in a booster. Squirming, slouching, continually leaning out of position or putting the shoulder belt behind their back or arm are all indicators that they may not be ready to handle the freedom of a booster seat. Thankfully, there are many 5-point harnessed seats on the market which are rated to 65 lbs or more and can accommodate bigger kids who still lack the maturity needed to be adequately protected in a booster seat. 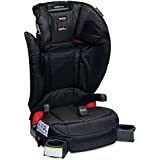 All infants and toddlersshould ride in a rear-facing car safetyseat (CSS) until theyare 2 years of age or until they reachthe highest weight orheight allowed by the manufacturer oftheir CSS. All children2 years or older, or those younger than 2 yearswho have outgrownthe rear-facing weight or height limit fortheir CSS, shoulduse a forward-facing CSS with a harness foras long as possible,up to the highest weight or height allowedby the manufacturerof their CSS. 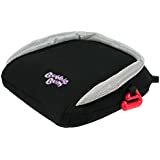 All children whose weight or height is abovethe forward-facinglimit for their CSS should use a belt-positioningbooster seatuntil the vehicle lap-and-shoulder seat belt fitsproperly,typically when they have reached 4 feet 9 inches inheight andare between 8 and 12 years of age. When childrenare old enough and large enough to use the vehicleseat beltalone, they should always use lap-and-shoulder seatbelts foroptimal protection. All children younger than 13 years shouldbe restrained in therear seats of vehicles for optimal protection. Boosters are recommended until at least age 8, though most kids will need to use one until they are 4’9″ tall (57″) and can pass the 5-step Test in each vehicle where they ride. I have three kids, including a 13-year old and an 11-year old who are tall enough to be out of a booster in most vehicles, but somehow still squirm out of their shoulder belt frequently, usually in order to poke or kick each other! They ride in a seatbelt, but for younger kids, a forward-facing carseat with a 5-point harness remains the safest choice until a child can sit correctly in a booster for the duration of a trip. For example, my 6-year old rides in a 5-point harness or a booster, depending on the vehicle and what I have installed at the moment. Here is a video of him in a few “Best Bet” boosters: a BubbleBum, a Clek Oobr and a Britax Frontier 85 SICT. Finally, many parents want to know if a backless booster is really safe. Other parents want to know if it is really necessary to spend the extra money on a high-back booster. The answer is that any booster that provides a correct fit of the lap and shoulder belt will provide a good deal of protection. However, if your child frequently falls asleep in the car, then a high-back booster is generally a better choice since the headwings will help your child stay in the necessary upright position. We go over some of the pros and cons of backless and high back boosters in a previous blog. Okay, okay, it’s boring… we know. But the dry information above is much more important in terms of saving the life of your child than is the choice between one booster or another! In fact, if you know how to make sure a booster fits properly on your child, in your vehicle, you can determine the best booster for your situation even without the ratings! That’s because these ratings from the IIHS are not crash test ratings at all. They are simply standardized assessments of how well the boosters fit one particular crash test dummy (6-year-old Hybrid III) under 4 different conditions which represent a range of seatbelt configurations in various real-life vehicles. This rating system doesn’t guarantee that a “Best Bet” product will fit your child better than a model that is listed as “Check Fit”, especially if your child is significantly larger or smaller than the 6-year-old Hybrid III dummy which weighs 51.6 lbs, has an overall height of almost 45″ tall, and a seated height of 25″. So, if your booster isn’t a “Best Bet” or even a “Good Bet”, it may still provide good protection for your child, but regardless, you need to check the belt fit. If it doesn’t fit optimally, try another backseat position in your vehicle to see if it works better there and read the instructions for more tips. With your vehicle and your child, you may find an exception where a lower rated model actually fits better than a higher rated one! Remember, proper fit of the seatbelt on your child while in a booster seat means that the lap portion of the seatbelt is low, touching the thighs, and the shoulder portion of the belt is across the collarbone. Now, on to the ratings! 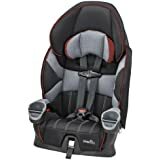 We’ve noted “Best Bet” models that are included in our own “Recommended Carseats” list (the Graco TurboBooster Elite, Argos 70 and Evenflo Symphony 65 e3 are updates of recommended models that we hope to review soon). In fact, we like most of the Best Bet models listed, but our list doesn’t include every model we like for editorial reasons. Some simply have not been reviewed yet and may be recommended in the future. Please note that on some boosters, you’ll see a – followed by the fabric name. IIHS tests different fashions within a line because the padding may be different and that difference can sometimes be significant enough to influence belt fit. You can find the full IIHS Booster Evaluation press release here along with some nice photos of proper lap and shoulder belt fit. Stay tuned to www.carseatblog.com and www.car-seat.org for more coverage and some Best Bet Booster giveaways, too! Nautilus gets a best bet if you actually click through to this list – it must be a mistake in one place or the other, any idea which? I’m just curious as to why the Argos made the ‘best bet’ list, when the Nautilus is on the ‘check fit’ list. Aren’t they the same seat pretty much? Can someone explain what is wrong with the Safety First seats? I had not heard before they were not good! Dear Evenflo, please redesign your program seats. It drives me nuts to hand these out at each check event. The lap belt is way too high on almost every child. Crunchy – I’m pretty sure the Express/Chase (and thefore the Sightseer too) are being discontinued. But regardless, it’s imperative that the person purchasing seats for any CPS program understand the pros and cons of the CRs they are buying and what the alternatives are. The Express/Chase is a decent harnessed seat even though it only goes to 40 lbs but the Sightseer dedicated booster is a relic and an absolute waste of money. I agree that it shouldn’t even be an option for programs to purchase the Sightseer but unfortunately when it’s the cheapest HBB option on the price list – some well-intentioned but clueless purchaser is going to order it. I find it very interesting that a couple of the “check fit” models are my kids’ favorite seats and they work very well for them. It shows that booster selection, like infant seat or convertible selection, is very important. It’s not a one-size-fits-all process, nor can it be a I’m-sick-of-my-kid-being-in-a-carseat-let’s-get-it-over-with process. Seatbelt design in vehicles is so variable that it makes a world of difference and what works in one vehicle may not work in another (as I found out between my 2 vehicles). Just because the kids who fit in these seats are older doesn’t mean they shouldn’t be as well-protected as their younger counterparts. wonderful! it really is important to remember that just because a booster isn’t a best bet, doesn’t mean it isn’t the right booster for that child in that vehicle with that budget… so wonderful to have a video with Mr. Jonathon showing us how the seatbelt should fit in a booster so parents can make sure their child is protected in the booster they are using! Thanks for great info, as always!